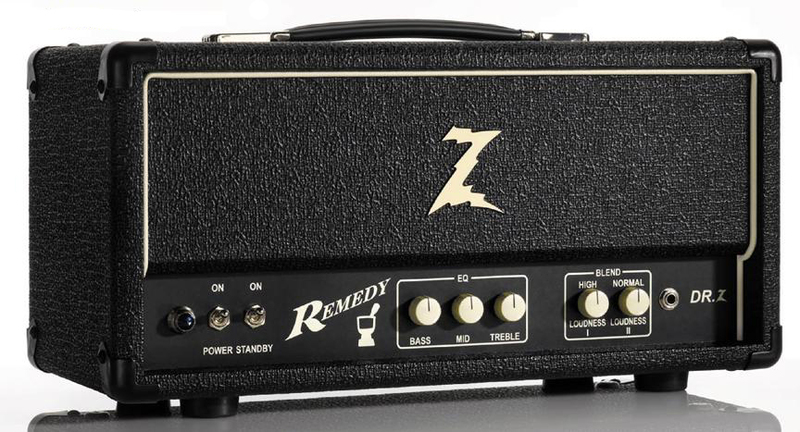 In yesterday’s little adventure at Guitar Player Magazine, I got a chance to play the new Dr. Z Remedy amplifier. This amp is based upon a classic Marshall JTM circuit design, but with a twist: Instead of 4 inputs that allow you to jumper the two channels, the Remedy has a single input and the channels are already jumpered. You then have the ability to blend the amount of high and normal channel amounts via the two loudness knobs. This amp is a lesson in simplicity. It has a three-band EQ, and the volume knobs for the High and Normal channels, plus Power On/Off and Standby toggles. That’s it. With this amp, you dial in your tone and sound levels, and play! The amp is powered by a quad set of 6V6’s, and man they sound sweet! The power tubes are JJ’s which have kind of a “hybrid” 6V6 tone – I use these myself, and I love them. They’re brighter-sounding than the classic 6V6, and they’re extremely durable. I’ve never had one of these fail on any of my 6V6 amps, so it’s not a surprise Dr. Z uses the JJ’s for their reliability. In a word, it sounds “big.” A lot bigger than I expected from just a 40 Watt amp. I played a Gibson ’59 Les Paul Special Re-issue through it and was really taken by the big sound that the Remedy produces. For classic rock and blues tones, this is an ideal amp. It responds incredibly well to picking dynamics and volume knob adjustments as well, which is why I mentioned you set your EQ and volume where you want it, then play. You can then adjust the cleanliness or dirtiness with your volume knob or attack. Very cool. You might dismiss the Remedy as another JTM clone as the circuitry is based upon that. But it has a sound all its own. The cleans are lush and defined, and the overdrive is nice and crunchy, and very little to no top-end raspiness. I think that’s an earmark of the 6V6’s. They just don’t get fizzy. I played around with the half-power switch a couple of times, and it works as expected. But I wanted to find out more about how Dr. Z does his half power mode, so I gave him a call this morning, and found out some interesting things about how he does his half-power mode – very interesting things, indeed. There are a couple of ways I’m familiar with that amp manufacturers introduce half-power modes in their amps. A common way is to shut down half a tube, essentially going from pentode to triode. According to amp builders I’ve spoken with, this is the easiest, but it also changes the tone significantly between the two modes. The second common way is to adjust the B+ voltage down, then provide some compensation so the correct heater voltages are maintained. This is what Jeff Aragaki does with his amps, and this technique is very transparent. Dr Z. takes a completely different approach and leaves the front-end alone entirely, and works his magic from the power transformer, something he worked with the late Ken Fisher to produce. I won’t go into details – and Dr. Z didn’t go into a great deal of depth – but he effectively bypasses the power from two of the power tubes then does some other stuff to compensate for the impedance mismatch to half the power. The end result is a very tonally transparent switch from full power to half power, using a method no one else is using; at least according to Dr. Z.
I love stuff like this! I’m no electronics guy, but I love it when people think out of the box to handle common problems, and come up with approaches that no one else thought of, or didn’t try because they thought it was too hard! Kudos to Dr. Z for doing something like this! I truly wish I had more time to spend with it so I could explore the amp’s capabilities more. Perhaps in the near future I’ll get that chance. Привет многие пользователей интернета рано или поздно знакомится в сети , конечно люди не одинаковые и каждый ищет что то свое кто ищет знакомства для интим встреч.Но проскакивают и совсем странные запросы. I am not positive where you are getting your information, but good topic. I must spend a while learning more or understanding more. Thank you for excellent information I was searching for this information for my mission.